WWE RAW RESULTS LIVE - FALLOUT AFTER RAW'S CLEAN SWEEP! Welcome back once again everybody to your EXCLUSIVE live coverage of WWE Raw! It is one day removed from the clean sweep from Raw over Smackdown at Survivor Series, and we look ahead to WWE TLC. Be sure to refresh the page throughout the night for continued coverage, and join us in the chat below, or on Facebook, or Twitter @pw_dotcom or @dougEwrestling. Coverage starts at 8/7C! 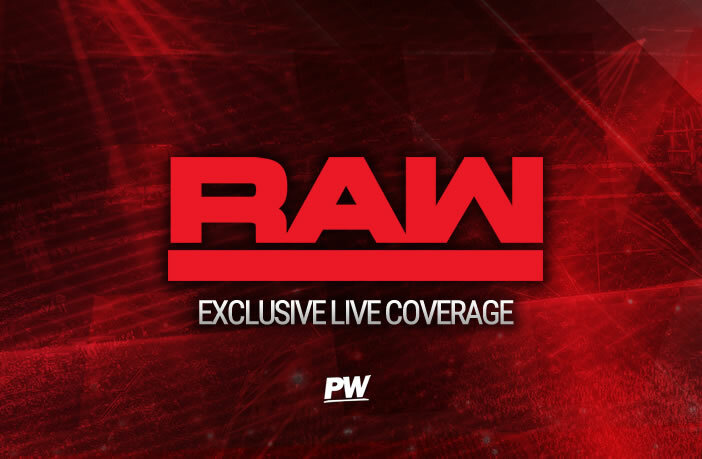 If you need to catch up, check out the Raw Preview HERE. Baron Corbin is in the ring and he welcomes us to Monday Night Raw, and he calls it the undisputed A-Show. He says that the credit for last night goes to one person, who is a titan of industry, and the commissioner of Monday Night Raw…Stephanie McMahon. Stephanie comes and says that she wants to soak in her accolades. She reminds everyone that last night was a clean sweep, and Smackdown did not beat them once. She credits and thanks Baron Corbin. She calls Raw a family and they all decimated Smackdown. She says that she hopes that everyone is ready, because they are going to celebrate. BRAAAAAUUUUUUNN… Braun reminds her that she promised him Baron Corbin. Stephanie says she did make promises and that at TLC, Braun will indeed face off against Baron Corbin. She tells Corbin that if he beats Strowman, then he will become the PERMANENT Raw General Manager. However, if he loses, he loses all authority as well. Braun reminds her then of his match against Brock Lesnar for the Universal Championship. Stephanie says that he can have his match with Brock Lesnar, provided that he beat Baron Corbin at TLC. Strowman agrees and says that he gets to pick the stipulation. He picks the TLC match. Corbin says this is horrible, but he doubts that Strowman will even make it to TLC, because he is still the acting Raw GM, and he makes a handicap match with Strowman facing off against Lashley & Drew McIntyre. Stephanie says she wants to add to that, as she turns it into a six man tag. It looks like Baron Corbin is going to start this match with Braun Strowman! The two size each other up and Corbin tags in Drew McIntyre. McIntyre gets in and gets right in the face of Braun. McIntyre tries to shoulder tackle Strowman but Strowman doesn’t move. Strowman bounces him off the ropes and Drew counters with a stiff kick to the face. Drew bounces off the rope again and Strowman knocks him down. The crowd chants for Balor and Strowman tags him in. Balor takes the right to the outside and slams McIntyre into the barricade. Back in the ring and McIntyre tags in Lashley, who takes it to Finn, and drives multiple elbows to him. Corbin is tagged in and and stops a tag from Balor to his corner. Balor tries again, and he’s just finger tips away, but Corbin delivers the deep six and goes for the cover, but Balor kicks out. Corbin tags in Lashley, but Balor tags in Elias who can’t wait to get his hands on Lashley. Elias hits multiple kicks to Lashley in the corner. Lashley looks to counter, but Elias hits a mule kick to Lashley. Corbin comes in and tries to distract Elias, but Elias throws him up and out of the ring. Elias gets hit from behind from Lashley, but Balor tags himself in and the two clothesline Lashley over the top rope. Lashley gets back in the ring and McIntyre surprise tags himself in and surprises Balor with a Claymore and eliminates him.